"I have not had a chance to contact the main office back, but wanted to praise the quick response when I complained about a maintenance problem. I had put in requests and when nothing happened I wrote a problem and within an hour someone was out here fixing everything! I am so thankful!" "Thanks to the maintenance guys the smell of gas coming from the furnace no longer exists. The guys came out and apparently preformed a good repair. Always courteous.. Awesome job!" "Last week the hall ways and door moldings and laundry room was painted in our building, and I have to say it brightens up the hallway and looks great! Also thanks to the maintainince guy who saw me out and asked if everything was going well and working right. Good looks for that!" "I requested maintenance online, and the response the response of receipt was almost immediate. I received a call the next day to schedule an appointment, as I requested. The maintenance employee came by only 15 minutes after the phone call. He was fast, friendly, and efficient. My problem was fixed, and I am satisfied. " "Thanks for keeping our parking lot clear despite the long hours you're working! And even after all day, Scott still came and investigated my apartment leak situation! Thanks folks for all the hard work!" "As always, a job well done. :-)"
Roundtree apartments are comfortably spacious and full of fantastic natural light. These one and two-bedroom apartments include a patio or glass enclosed balcony, L-shaped kitchens and ample storage & closet space. We’re conveniently located on Ellsworth Road, just off Carpenter Road & I-94 making getting around Ypsilanti and exploring Ann Arbor effortless. Eastern Michigan University & Washtenaw Community College are less than 10 minutes away, The University of Michigan’s Ann Arbor campus is less than 20. 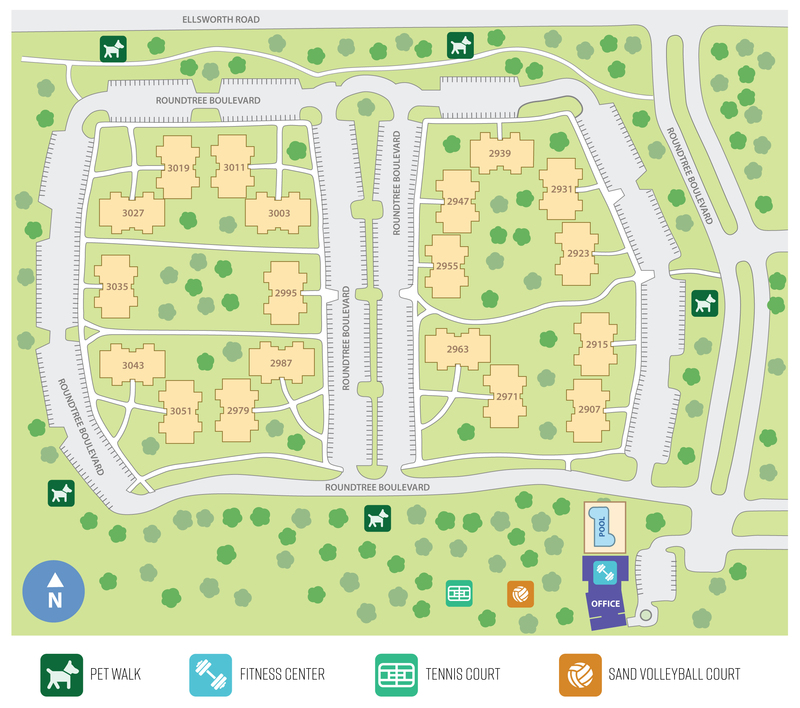 Our pet friendly and smoke free community is scenically enveloped around lush landscaping and mature trees. Roundtree’s 24/7 Fitness Center, swimming pool, tennis court, sand volleyball and free wi-fi sundeck award recreation for everyone.